Love the idea of adding broccoli stems to smoothies! I like using berries and almond milk. I am all for experimenting! I really want to try that peanut butter with brocolli one! Great idea to make a healthy smoothie - you can hide a lot of good things in there. I have been enamoured of a chocolate spread with peanut butter lately so I sort of understand your peanut butter carob obsession - even if not quite into the carob flavour. I quite like the idea of peanut butter in smoothies but am less inclined to experiment with it due to Sylvia's peanut allergy - however I have been experimenting with cauliflower lately so the smoothie addition sounds like a great way to get a few more veg in. Oh my goodness - I am OBSESSED with the peanut butter & carob combo at the moment too! Great minds! 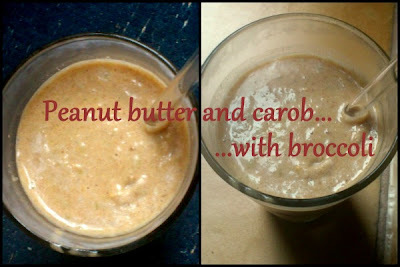 I hope you enjoy it if you do - and I'm glad to find another carob/peanut butter lover. So many people dislike carob most unfairly! I've always eaten teh broccoli stem, even as a kid. I honestly didn't realise people threw it away or tried to hide it in things. it's so good raw! Stir-fried! In soup! You know I'd love this. But I'm still more likely to just mix pb, carob, maple syrup, and nutritional yeast together with a spoon and eat it straight. Ooooo wacky Kari! I used to like banana smoothies.. now I can't stand bananas. My Nan puts avocado in them :) I do make green smoothies now though. Feel healthy right after consuming it! They do have that effect - it's quite wonderful! Great minds think alike my friend. I recently started doing the exact same thing with my broccoli and cauliflower stems. So good right?? Love the strawberry and mint combo! Strawberry mint avocado, please. That one sounds incredible. I haven't tried broccoli or cauliflower stems yet, but now I will! What do I like in my smoothies? Absolutely everything, but I love adding spirulina to green smoothies. The color is so vibrant and it increases the protein count. Have a great weekend! Thanks Heather! Spirulina and I have a bit of a mixed relationship but I need to try and improve it I think - it is so good for you. Both of these smoothies look fantastic! I love the idea of adding broccoli or cauliflower to smoothies! I'm featuring your smoothies this week :) Hope to see you back this week!